I got to Glen Abbey just before 10am and was so glad there was a bit of cloud cover with lower humidity. Made it much more bearable for spectators. I figured there'd be decent scoring and after seeing a few of the early groups that seemed to be the case for some as the day progressed. Got to see the smooth swing of Danny Lee from New Zealand. Sponsored by Devereaux a golf apparel company I've done an apparel review on before. He's also sponsored by ZTE devices who was well represented at the RBC Canadian Open as a corporate sponsor. Got up close and personal with Vijay Singh on the ninth hole. Vijay hit his shot close to a tree that I happen to be standing near but that didn't phase him in the least as he calmly walked up to the ball and hit a lovely shot to the green. It was also great to see Ernie Els play on the weekend and see his smooth swing and watch him putt with his SeeMore putter. Jason Day teed off to one of the largest crowds of the day and he was teeing off at 11:35 and was -2 at the start of the day. Day had a huge gallery all day and it was great to be able to see the number one player in the world live hitting shots on Canadian soil. 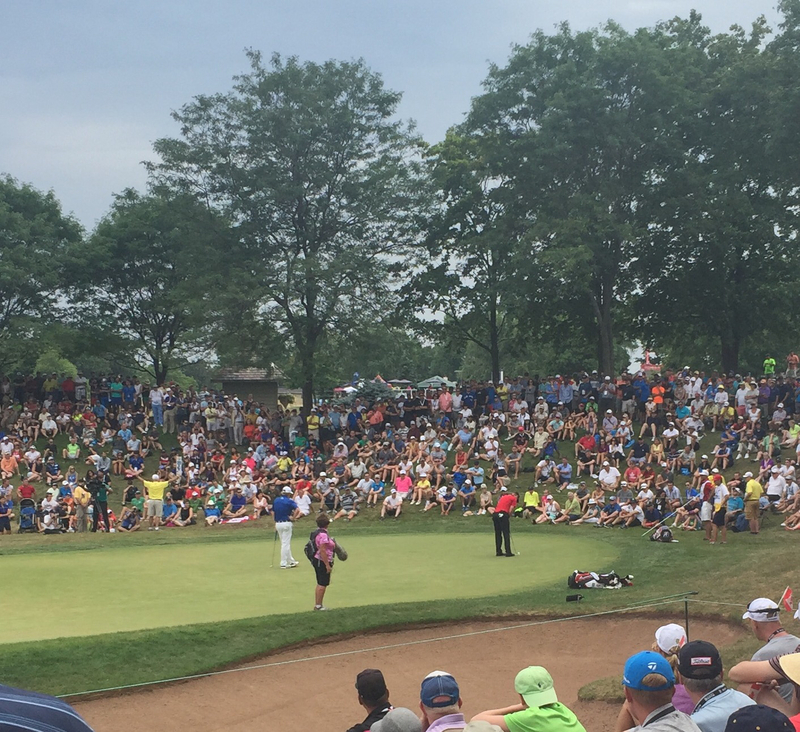 Jason Day ended up at -7 after shooting a 67 on Sunday good for a tie for 14th. As the morning turn closer to noon and more players teed off including eventually winner Jhonattan Vegas who birdied 5 of his first first 6 holes. You could feel you were going to be in for a special day. Fans were excited and keen on following the action including one of the biggest crowds following the #1 ranked Canadian amateur Jared du Toit who only had 15 people following him Thursday. His interaction with fans was awesome and he was loving every minute of the day and being in the spotlight. Eventually settling for a 71 and a tie for 9th. He can hold his head high as he made Canada proud and now a few more people know and may follow what he does further in his career. 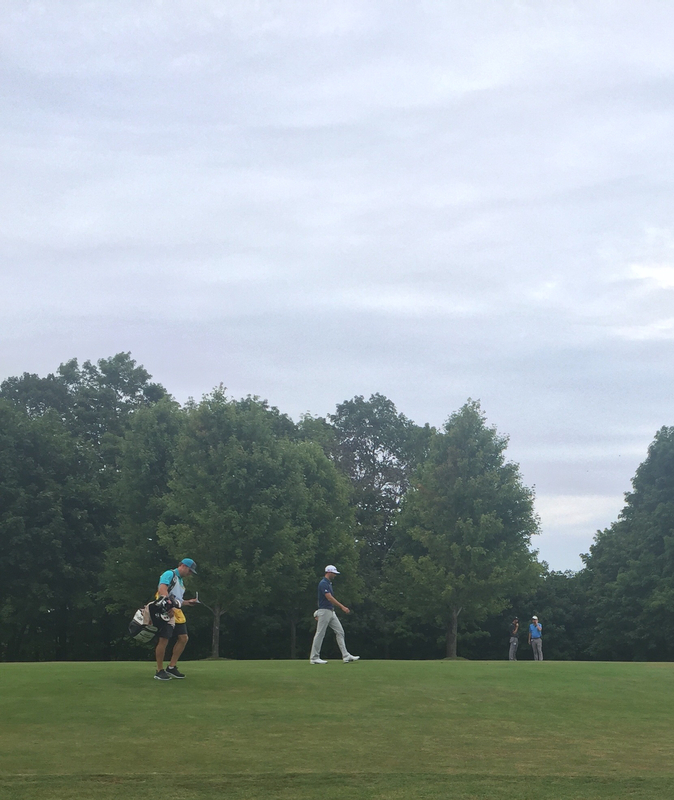 Following the last let's say 10 groups on Sunday was very exciting as many players were making birdies and putting themselves into contention for the Canadian Open Trophy. I ended up seeing the last nine groups come through the par 5 16th which was a great hole to watch all weekend as players continue to bomb their drives down the fairway. One of the players that impressed me the most was the reigning US Open Champion Dustin Johnson his interaction with fans and the way he conducts himself on the golf course was a pleasure to watch and be a part of it. Although he didn't have the final-round he probably would've liked I think he's the favourite this week to win the PGA Championship at Baltusrol. It was great watching Dustin Johnson hit his driver all weekend the man crushes his drives and his putting is at an all time high. 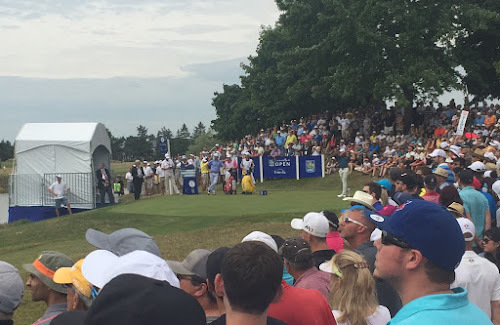 I ended up having to leave before a champion was crowned at Glen Abbey but that's okay I'll be back because golf in Canada is strong and Glen Abbey is a great place to watch the pros compete for Canada's Major.